Govt Polytechnic Hisar Recruitment Notification 2018.Govt Polytechnic Hisar inviting applications for the positions of Visiting Faculty/Visiting Instructor.Interested and Eligible candidates can apply for the positions. 2. The essential qualification, guidelines are available on Departmental website www.techeduhry.gov.in and application format is available on Institution website www.gphisar.ac.in. 1. The application duly filled in must reach the office of Principal Govt. Polytechnic, Hisar latest by 03.09.2018 (up to 5:00 p.m.) by hand or by post. The application form must accompany all the required documents duly attested by the applicant. Only short listed candidates will be called for interview and the list of short listed candidates (As per norms of Technical Education Haryana) and date of Interview will be displayed on the institution website www.gphisar.ac.in. 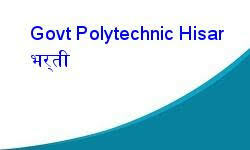 The interview will be held at Directorate of Technical Education, Haryana bays No. 7-12, Sector-4, Panchkula. 1. No TA/DA will be given to the candidates for attending interview. 2. The original documents to be produced at the time of interview. 3. Candidates shall submit single application giving choice of stations.